A bit of a grey day, and my body unwilling to work very hard at first, in protest against the night before – but we made a fairly gentle start, which was down hill anyway (losing a couple of hundred metres in the first ten kilometres). The route had no monster hills, but plenty of little ones – two or three miles up, then down again, and so on – we were cutting across a number of river valleys. By now, we were on a main road, the N547, and frequently passed foot pilgrims. We stopped at a café in Melide, and though it was early for elevenses, we decided to have an omelette. Due to a language mix up, three omelettes appeared! They were nice but solid. High speeds were out of the question for the next few miles, until our stomachs had regained their normal size…. As we rode up one hill, we caught up an Italian couple on a tandem; we also saw a couple of Dutch pilgrims on mopeds; riding a moped several hundred kilometres takes a heroic amount of dedication! A little before lunch, Chris clocked up his 1000 miles, so we stopped for photos. 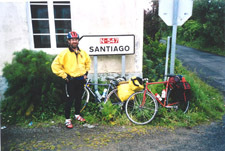 Further on, we came to a big roundabout, and took the road to Santiago. It was a very wide dual carriageway… and then it dawned on us that we were on a motorway! We gingerly crossed it, climbing the barriers, and got over a fence. This brought us to a small road encircling the airport, which led in the right direction. 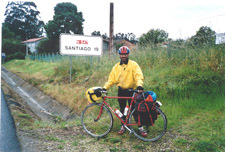 It was a strange day, because previously, we’d pressed on to our overnight stop, but on this day, we didn’t want to arrive in Santiago until Jane had flown in from London. Hannah was coordinating operations, so we sent and received texts. It was time for lunch. We stopped at a bar about 10 km outside the city, enjoyed a beer, and a game of snooker. Then the call came from Hannah – Jane had arrived, time to get to Obradoiro Square, and the cathedral. We sped off, then I noticed something odd about Chris, and I realised he wasn’t wearing his helmet! I went back to get it; I wasn’t prepared to let him go for it, unprotected! As we rode down to the city, I took extra special care to ride safely, keeping further behind Chris than usual. It turned out we were both worried about having a last minute crash after all the miles we’d covered. 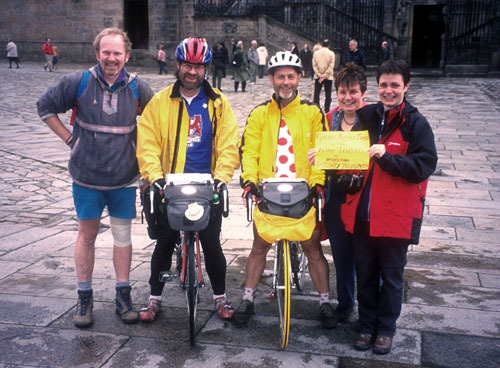 It was odd cycling in city traffic, after all the rural roads, and then suddenly, we were in Obradoiro Square, and there were Jane, Hannah and Paul, her boyfriend. If you look just in front of my left foot, you can see the scallop shell paving stone - the last step of the journey. There is a stone shell in the middle of the square, the traditional end of the pilgrimage. Reaching it was a very emotional moment. As we hugged each other, there were tears in my eyes – it was great to see Jane, Hannah and Paul – my mum would have been proud of her boys for completing the journey! While Paul looked after the bikes, the rest of us went inside to say hi to St James in the traditional manner. There are a couple of things a pilgrim has to do on reaching Santiago cathedral; first, just inside the main doors, you kiss St James on the head, well, his statue’s head, anyway, which is quite low, so you put your hands on a column as you bend down, and you find that you are resting your hands in hand shaped hollows, formed by the thousands of pilgrims who have done the same thing before you. I felt a solidarity down the centuries. Then, we made our way to the high altar . Another statue, another greeting – you go up behind the high altar, and rest your hands on his shoulders. They are smoothed by the touch of many hands. When I held the statue, I offered a prayer of thanks for a safe and wonderful journey. Next stop was to visit the office near the Cathedral for our Compostela. This is a certificate awarded to pilgrims on completion of their journey. 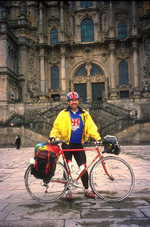 (More from http://www.csj.org.uk/compostela.htm) It was good to meet the three cyclists from Holland, who had also completed their pilgrimage.